Is Unrepented Sin Destroying Your Life? No Comments on Is Unrepented Sin Destroying Your Life? Is there unrepented sin in your life? Have you done something so awful that you try your best not to think about it? Do you feel as if God was a thousand miles away from you because of what you have done? Why did he stay behind in Jerusalem when he was supposed to be out leading his men in battle? Maybe he felt tired. Maybe he felt lazy. Maybe he felt bored. Maybe he felt sorry for himself. Maybe he felt no one really understood him. Maybe he had become distant from God and was therefore, not open to hear God’s voice warning him about what he should be doing right at that moment. Maybe he was planning all along to commit adultery. Whatever the reason, David was not where he was supposed to be, and he was not doing what he was supposed to be doing. The stage is set for tragedy! Are you thinking you are bored with your life? Maybe you think your spouse has been unfair to you or doesn’t show you the love and respect you deserve. Maybe you think your family doesn’t appreciate all the things you have done for them. Maybe you think it’s time you had some fun and looked after you for a change. The stage is set for tragedy! You have let your mind take you where you should not go. You have let the devil whisper thoughts to you, but he is the father of lies. What he has whispered to you was not true, yet you believed him. Now you are against your spouse, against your children, against your boss, or against your friend. You have believed the lies. Now all you can think of is “poor me. No one cares about me. No one loves me.” The stage is set for tragedy! David got up one evening and walked on his roof. Really? He has a palace – no doubt beautiful gardens to walk in. What’s he doing on the roof? What’s he looking for? “One evening David arose from his couch and was walking on the roof of the king’s house, when from there he saw a woman bathing; and she was very lovely to behold. David sent and inquired about the woman. One said, Is not this Bathsheba, the daughter of Eliam and the wife of Uriah the Hittite? And David sent messengers and took her. And she came in to him, and he lay with her- for she was purified from her uncleanness. Then she returned to her house. And the woman became pregnant and sent and told David, I am with child” (II Samuel 11:2-5). David wasn’t where he was supposed to be He wasn’t doing what he was supposed to do. His mind was not where it was supposed to be- on his own family. He forgot the God who had been with him and helped him through so much. “He” was suddenly all that mattered. Now he has sinned. Big time! Now what should be done here? Own up to what’s been done? Confess the sin and beg for forgiveness from God and man? Is this what David did? Nope!! David panics realizing he has slept with another man’s wife and now she is expecting his child. Does he try to protect her family or his family? No, he tries to protect himself. “David sent to Joab, saying, Send me Uriah the Hittite. So Joab sent Uriah. When Uriah had come to him, David asked him how Joab was, how the people fared, and how the war progressed. (Oh, brother!) David said to Uriah, Go down to your house and wash your feet. Uriah went out of the king’s house, and there followed him a mess of food (a gift) from the king. But Uriah slept at the door of the king’s house with all the servants of his lord and did not go down to his house. When they told David, Uriah did not go down to his house, David said to Uriah, Have you not come from a journey? Why did you not go down to your house? Uriah said to David, The ark and Israel and Judah live in tents, and my lord Joab and the servants of my lord are camping in the open field. Shall I then go to my house to eat and drink and lie with my wife? As you live and as my soul lives, I will not do this thing. And David said to Uriah, Remain here today also, and tomorrow, I will let you depart. So Uriah remained in Jerusalem that day and the next” (II Samuel 11:6-12). So David sends for the husband and brings him home from battle to try to get Uriah to sleep with his own wife so David can lie. He can then lie and say that Bathsheba’s baby was Uriah’s not his. He does everything he can to keep the deceit and lies going, but the problem is, David has run into a truly honourable man. How far will you go to cover up sin in your life? Do you think you are really intelligent with your deceit and lies? You may think you’ve gotten away with your sin because no one knows what you’ve done. Now David has gotten Uriah drunk and yet still the strength of Uriah’s character will not let him desert his men fighting in battle even for his own pleasure. No doubt David worried all night. He does not think of being honest. He does not think of repenting for what he’s done. He doesn’t think of the God who loves him so dearly. He thinks only of himself. In verse fourteen, David sends a deadly letter. “In the morning David wrote a letter to Joab and sent it with Uriah. And he wrote in the letter, Put Uriah in the front line of the heaviest fighting and withdraw from him, that he may be struck down and die. So when Joab was besieging the city, he assigned Uriah opposite where he knew the enemy’s most valiant men were. And the men of the city came out and fought with Joab, and some of the servants of David fell. Uriah the Hittite died also” II Samuel 11:14-17. Now to cover up his horrible sin, David has committed murder. He has had an honourable and faithful man killed to cover up his own sin. Bathsheba mourned for her husband. “When Uriah’s wife heard that her husband was dead, she mourned for Uriah” (II Samuel 11:26). No doubt she loved this honourable man. Did all this pain matter to David? Nope. He was having his fun and covering up his sin. No one else mattered. Now does David realize how awful is all this that he has done? Is he repentant over all the horror he has caused? Nope. Now he steals another man’s wife, he takes what is not his, and makes Bathsheba his wife. “And when the mourning was past, David sent and brought her to his house, and she became his wife and bore him a son. But the thing that David had done was evil in the sight of the Lord” (II Samuel 11:27). Now it’s all done David has accomplished everything he set out to do. He slept with the woman he was lusting after, killed her husband, and now stole her from her husband so she could be his wife. Unfortunately for David and for all of us, there is a God who sees, there’s a God who cares about people wronged, there’s a God who judges, and there’s a God who punishes evil. God sent the prophet, Nathan, to David to tell him a story. “And the Lord sent Nathan to David. He came and said to him, There were two men in a city, one rich and the other poor. The rich man had very many flocks and herds. But the poor man had nothing but one little ewe lamb which he had bought and brought up, and it grew up with him and his children. It ate of his own morsel, drank from his own cup, lay in his bosom, and was like a daughter to him. Now a traveler came to the rich man and to avoid taking one of his own flock or herd to prepare for the wayfaring man who had come to him, he took the poor man’s lamb and prepared it for his guest” (II Samuel 12:1-4). Now David gets extremely upset over the injustice in this story. “Then David’s anger was greatly kindled against the man and he said to Nathan, As the Lord lives, the man who has done this is a son (worthy) of death. He shall restore the lamb fourfold, because he did this thing and had no pity” (II Samuel 12:5-6). Now Nathan tells him that his little secret is a secret no longer. What evil was done in secret, God has seen all of it!!! “Then Nathan said to David, You are the man! Thus says the Lord, the God of Israel: I anointed you king of Israel, and I delivered you out of the hand of Saul. And I gave you your master’s house, and your master’s wives into your bosom, and gave you the house of Israel and Judah; and if that had been too little, I would have added that much again. Why have you despised the commandment of the Lord, doing evil in His sight? You have slain Uriah the Hittite with the sword and have taken his wife to be your wife. You have murdered him with the sword of the Ammonites” (II Samuel 12:7-9). David has been caught in his secrecy, lies, and deceit. God was not going to let an honourable man like Uriah be treated in his horrible fashion with no recourse. “Now, therefore, the sword shall never depart from your house, because (you have not only despised my command, but) you have despised Me and have taken the wife of Uriah the Hittite to be your wife. Thus says the Lord, Behold I will raise up evil against you out of your own house; and I will take your wives before your eyes and give them to your neighbour, and he shall lie with your wives in the sight of the sun. For you did it secretly, but I will do this thing before all Israel and before the sun” (II Samuel 12:10-12). Finally David realized the full scope of what he has done. “And David said to Nathan, I have sinned against the Lord. And Nathan said to David, The Lord also has put away your sin; you shall not die. Nevertheless, because by this deed you have utterly scorned the Lord and given great occasion to the enemies of the Lord to blaspheme, the child that is born to you shall surely die” (II Samuel 12:13-14). Even though we truly repent before God for what we have done, sometimes things like crimes against humanity still have to be paid for. Someone on death row for murder may repent and be totally forgiven where God is concerned, but still be put to death to pay society back for what they have done. As Nathan leaves, David’s child is stuck with illness. “Then Nathan departed to his house. And the Lord struck the child that Uriah’s widow bore to David, and he was very sick. David therefore besought God for the child; and David fasted and went in and lay all night on the floor” (II Samuel 12:14-15). Even though David was told what would happen, he still tried desperately to change the outcome of his sin, but sin has a price. Sometimes, unfortunately, it’s a great price. “But when David saw that his servants whispered, he perceived that the child was dead. So he said to them, Is the child dead? And they said, He is” (II Samuel 12:19). “Then David arose from the floor, washed, anointed himself, changed his apparel, and went into the house of the Lord and worshiped. Then he came to his own house, and when he asked, they set food before him, and he ate” (II Samuel 12:20). David paid dearly for his sins, but because of his truly repentant and contrite heart, God could forgive him and continue to bless him abundantly. It was a tough lesson to learn, and many people were destroyed because of David’s sin. David would continue to have troubles with his children for the rest of his life. His son, Absalom, tried to take over David’s kingdom (II Samuel 18), and his son, Ammon, raped his sister, Tamar. Then Absalom, Tamar’s full brother, kills Ammon, and the troubles go on and on (II Samuel 13). All because David left God’s presence and thought only of himself and what he wanted. There are people who say they are sorry very easily. They sin and tell the person they have wronged, “I’m sorry”. Then they turn around and do exactly the same thing again, and they say, “I’m sorry”. God has not forgiven any of this because the person has never truly repented for what they have done. Saying, “I’m sorry” should mean that you will make every effort to make sure you will never repeat that evil behaviour ever again. 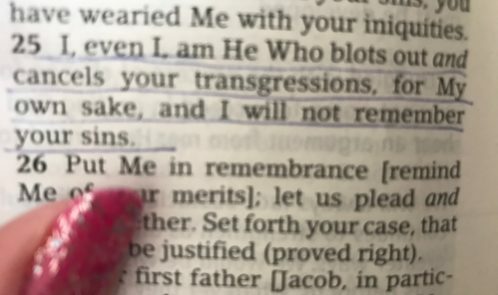 That is the true repentance that God honors. If you truly repent for what you have done, God can continue to bless you. He forgets your sin completely and makes you a new creation in Him. I encourage you to stay close to God and learn to listen to His voice. I’m sure if David had been in tune to God’s voice, the way he should have been, God would have been telling him to get to leading his men the way he was supposed to be doing. Then this awful sin would never have been a part of David’s life. How much different David’s life and the lives of his family could have been! I pray we all stay close to God, stay in tune to His voice, and heed the protective warnings He whispers in our ears. He love us and wants to keep deadly sin from destroying our lives. We simply need to listen to Him to stay safe. We need to repent of our sins to Him, and let Him forgive what we have done and make our lives new. Living with unrepented sin will destroy you, and that is not what God wants for your life.